Presenting your new family member….Fido? Pets Palace discuss how best to choose - and celebrate - the name of your new puppy! Bringing a new puppy into your home is an exciting time for all, there is nothing quite like it. Often or not, owners like to take some time to name their new puppy. This could be a decision that the whole family could make, including children or your individual self. Puppy names can be decided upon the appearance or the personality of the puppy. However, the growing popularity of hybrid designer dogs shows that there is an increasing interest in exotic and unique dogs. Examples include: Buggs (Boston Terrier/ Pug mix) or Pompoo (Pomeranian/ Toy Poodle mix). Therefore, names could get more creative to reflect this such as Jacinta, Samuel or Maxima. Whatever puppy name you choose, ensure your new puppy feels at home with their own personalised bowl or blanket. 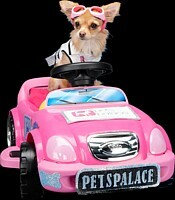 Pets Palace is one of Australia's largest online stores for Dog and Cat products and accessories; including a wide range of personalised pet products to ensure that any name can be personalised onto a blanket, bowls, collars and more. Furthermore, to assist our fellow puppy owners, Pets Palace also have a handy checklist of the essential must have products when you bring your new puppy into your home.